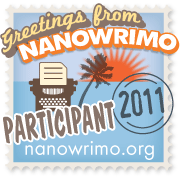 ARE YOU NOT NANO-ING THIS YEAR DUE TO CONSTRAINTS—AND UNHAPPY ABOUT IT? KEEP THESE POINTS IN MIND! Ah, it’s that time of year—NanoWrimo, in which those of us who are looking for a lot of diversion for 30 days hole up in our homes, coffee shops or libraries and party on with our laptops and AlphaSmart Neos to write 50,000 words in 30 days. I’ve done Nano a few times, and won most. In fact, my novel Bad Apple, which is forthcoming from Vagabondage Press Books early next year, was sort-of a Nano project—I wrote the whole thing in nine days in September of 2005, then used Nano as my first revision timeline. The novel has undergone heavy and extensive revisions since then, a few times over—but wow the fun I had doing it. When they said ‘literary abandon,’ they weren’t kidding. This year, I won’t be joining the happy throngs of burgeoning novelists—I’ve just got too much on my plate. I actually feel guilty about that. Writer Stacey Longo, though, shared some advice with a classroom full of writers recently that reminded me that whether I do Nano or not, that doesn’t make me any less of a writer—I’m a writer all year, and that this November there are things I can do that keep me in touch with that part of myself. n Re-read your favorite writing advice book. n Read a book you’ve been meaning to get to forever and haven’t had time. n Clean out your writing files—chuck old drafts, notes, etc. that you don’t want. n Hang out with a writing friend. n Research places to submit your work, then if you have anything, submit, submit, submit. n Get your future story ideas in order. So, if you’re NOT doing Nano this year due to lack of time, or energy, or craziness in your life, and you’re feeling some loss—remember, there’s always next year. Until then? Check out Stacey’s article. What she shared with the class reminded me there are other things we can do in November to keep that feeling of loss and disappointment at bay—and that if you’re a writer then you’re always at it no matter what the calendar says. Posted on November 2, 2011, in Deep Thoughts & Fun Stuff and tagged How to manage writing time, NanoWrimo, National Novel Writing Month, New England Horror Writers, Stacey Longo, Tips for NanoWrimo. Bookmark the permalink. Leave a comment.